A cycle of seven plays sounds like something epic in scope: a grand and sweeping project that might span generations or continents. But Ike Holter’s Chicago cycle does the opposite of that. Chicago is a city of neighborhoods, and Holter’s series tells the story of one (fictional) neighborhood in particular: Rightlynd, a big-hearted, hardscrabble stretch of blocks where locals don’t take too kindly to the notion of brunch. Rightlynd is also the name of Holter’s triumphant new play, in which he adds a bold, profane and electrifying chapter to his saga. Calling the play a love letter to Chicago feels a little old-fashioned; it’s more like a tenderly horny DM. Although Rightlynd is the fifth installment in Holter’s cycle—which so far also includes Exit Strategy, Sender, Prowess and The Wolf at the End of the Block—it’s chronologically the first, and it functions like a prequel to the others. 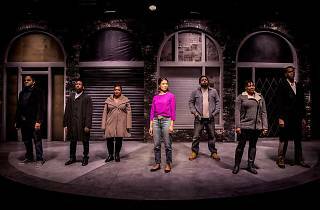 The play is concerned with a kind of original sin: how a gal named Nina Esposito (Monica Orozco) ran for Alderman of her local ward as a champion for the people, won the seat, and then sold everyone up the river. Of course, Nina’s sins aren’t anywhere close to original: She’s only the latest in a long line of corrupt Chicago politicians who have kowtowed to developers and gentrifiers. The fact that Nina could have been different ends up making no difference at all. Holter comes from the storefront scene, and director Lisa Portes wisely brings a feisty DIY simplicity to this production. 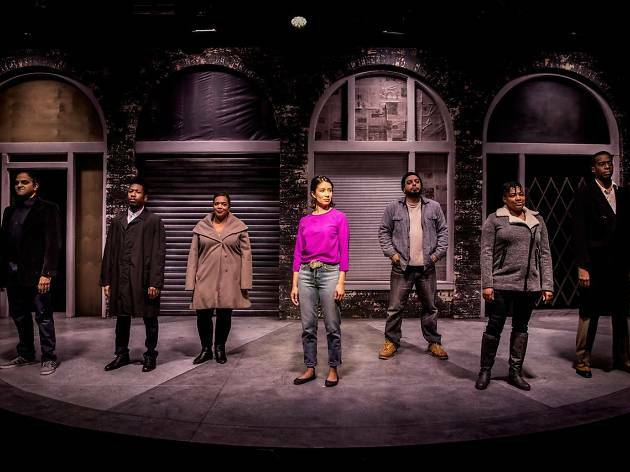 Collette Pollard’s simple, versatile set gives Portes and choreographer Breon Arzell plenty of room to send cast members pinging across the stage. The story moves almost as swiftly as Holter’s rapid-fire dialogue, pivoting from news reports and montages to original songs (by Charlie Coffeen) and a winkingly staged fight scene (by violence director Jaq Seifert). But for all the ruckus, the play never feels too busy; it’s exactly as frenzied as it needs to be. The cast is stellar, especially Eddie Martinez as a charmingly hangdog ex-con and Robert Cornelius as his exquisitely profane boss. (Holter’s gift for curse words might be unparalleled.) And Orozco is magnificent is Nina, embodying a dogged, rash idealism that goes bad and then metastasizes. And her final scene is truly chilling. Transformed into the figure who will loom over the cycle’s stories to come, she emerges as a villain worthy of an origin story. Victory Gardens Theater. Written by Ike Holter. Directed by Lisa Portes. With Monica Orozco, Jerome Beck, Robert Cornelius, LaKecia Harris, Anish Jethmalani, Eddie Martinez, Sasha Smith. Running time: 1hr 30mins. No intermission.